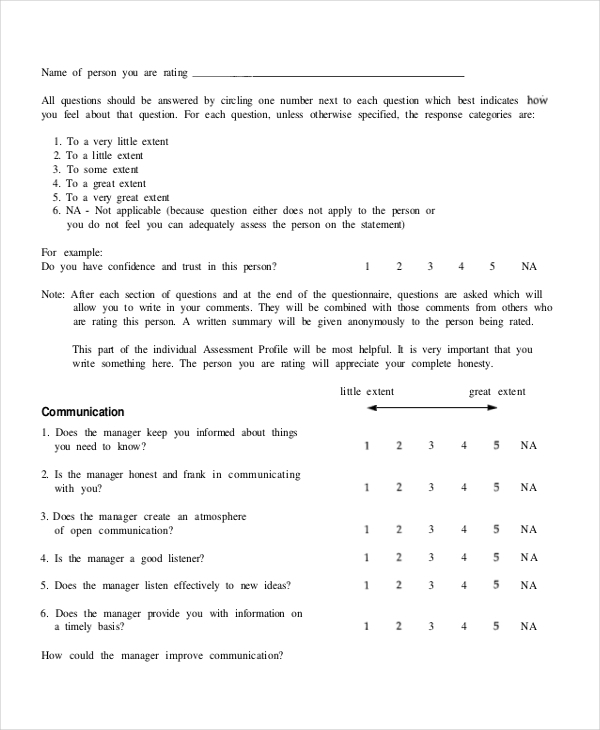 An appraisal form is generally used to gauge the performance of a person or a team in a given circumstance. This form is used by a person in an authoritative position to assess the performance of another party. It comprises of important questions and subheads which can help the authoritative party to check relevant details and come out with a perfect assessment. 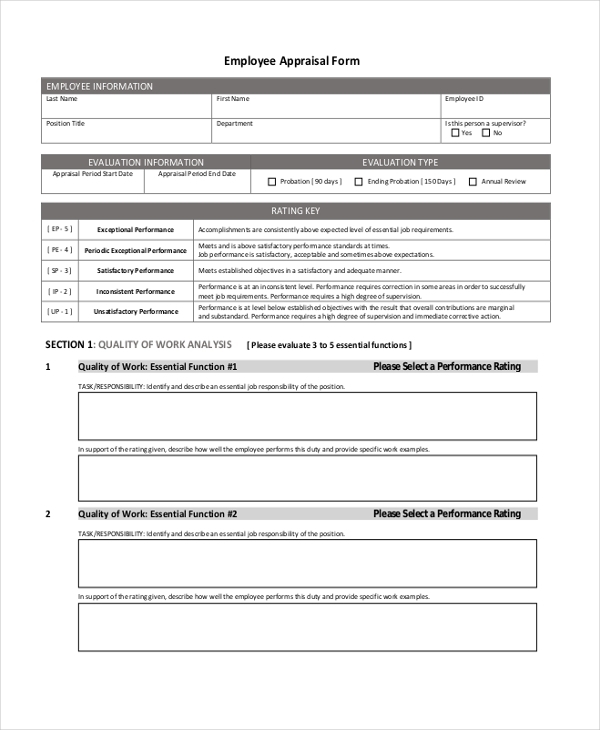 An appraisal form is used by business organizations, hospitals etc. 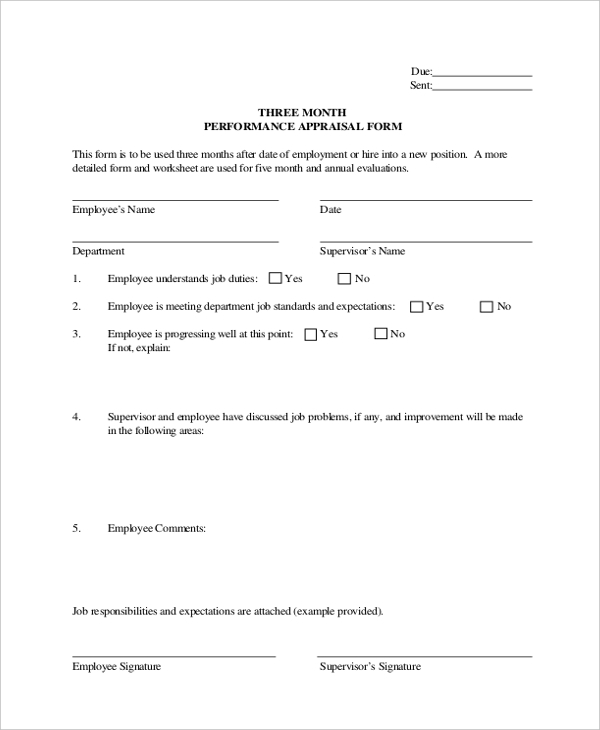 This form is used by a business organization to assess the performance of its employees over the period of a financial year. The form comprises of a number of questions that help them to make the assessment. 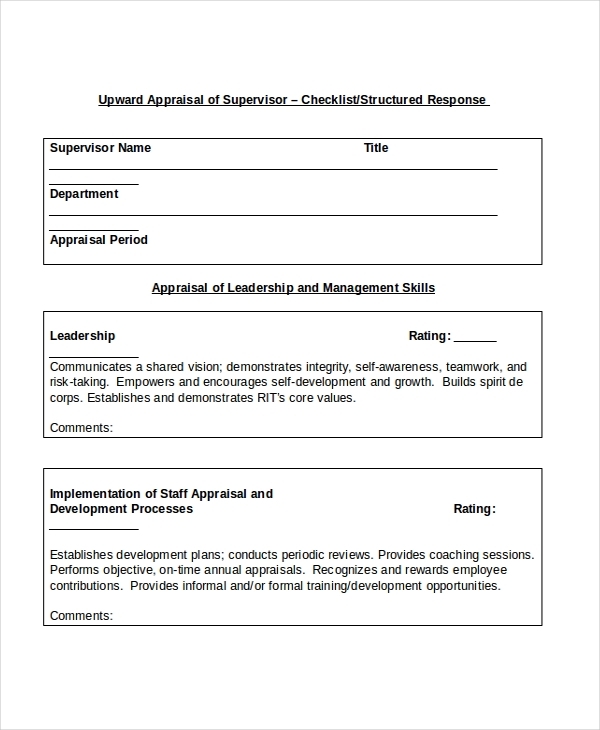 A basic appraisal form is generally used when an organization intends to gauge its employees’ skills and personality. With relevant questions present in the form, the assessment process becomes quite easy. This form gives the user a rough idea of what the format of an appraisal form should be. The user can use this form just the way it is or make changes to it to suit his requirements. 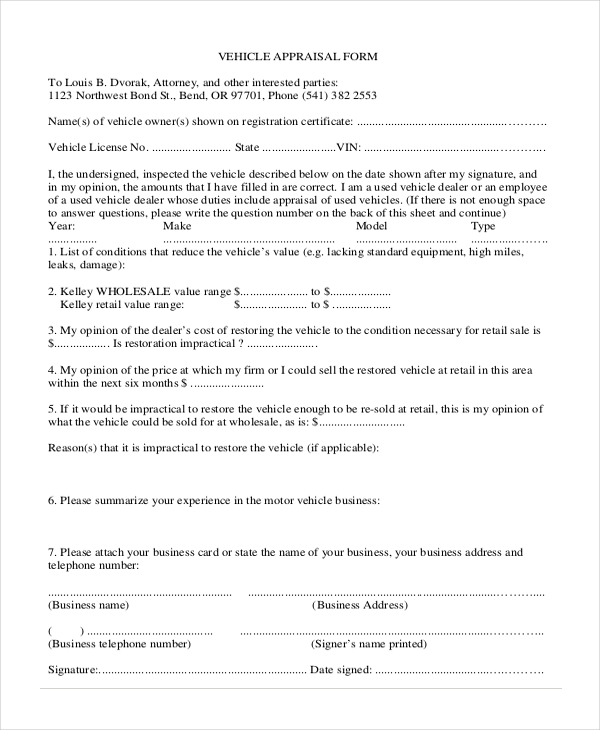 An automobile expert uses a car appraisal form to assess the condition of a used car. He checks all the relevant details of the car and notes it down in the form which comes in handy when the car is resold or repaired. 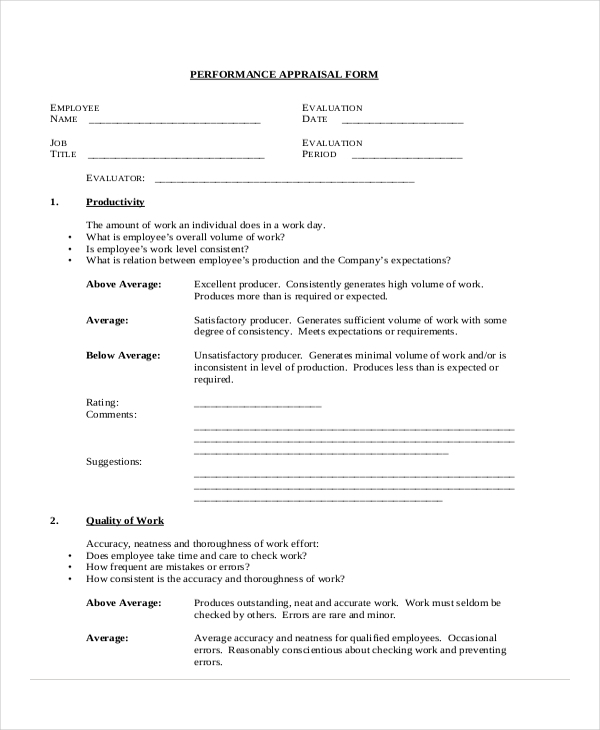 As the name indicates, an employee appraisal form is used by an organization to gauge the performance of its employees over a given period of time. The concerned authority fills the form with all the relevant details. 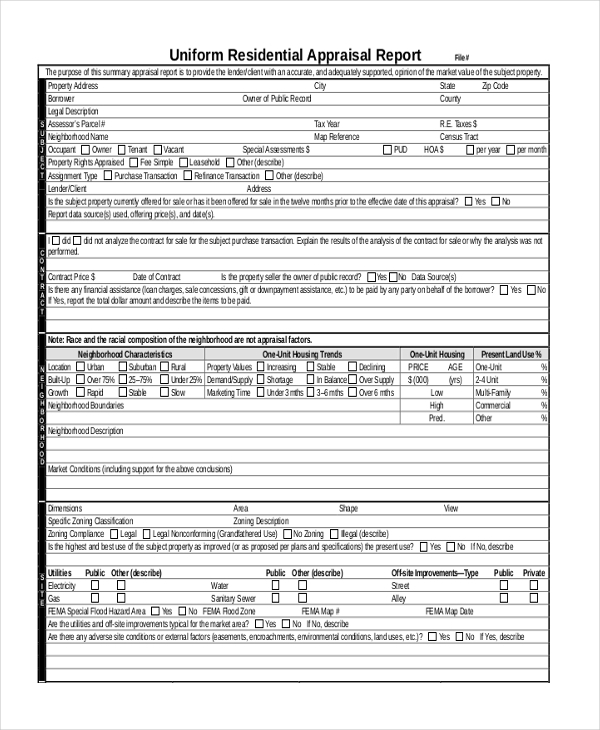 This form is used by a hospital/medical facility or a doctor to assess the health condition of a patient. The form contains various questions that can help in correctly analyzing the health of the person. 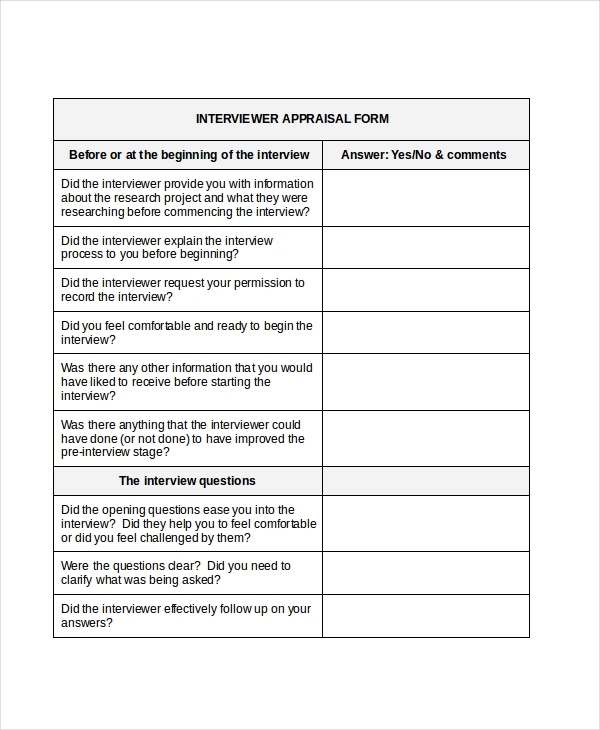 An interviewer uses an interview appraisal form to note down the performance of a candidate he might have interviewed. He fills the form with relevant details that later helps the company to make an informed decision during the hiring process. 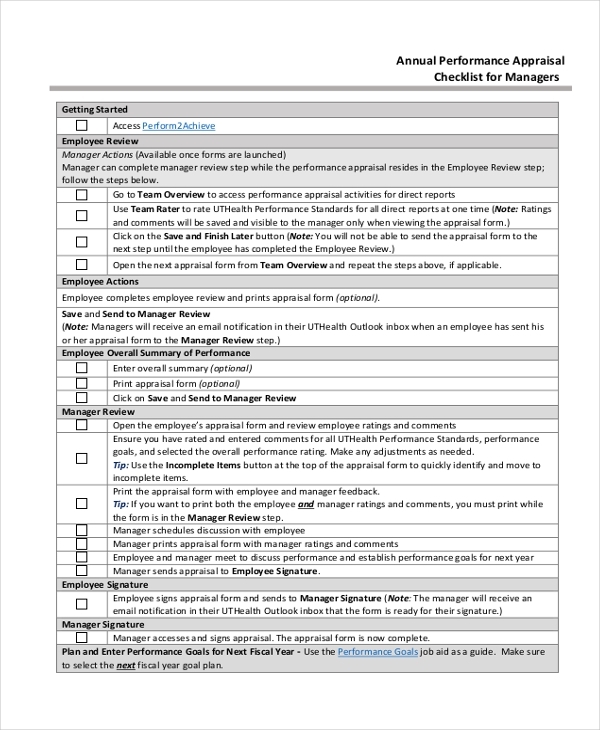 This form is used by an organization to evaluate the overall performance of an employee in the company. The person doing the assessment needs to fill in all the subheads with his inputs. 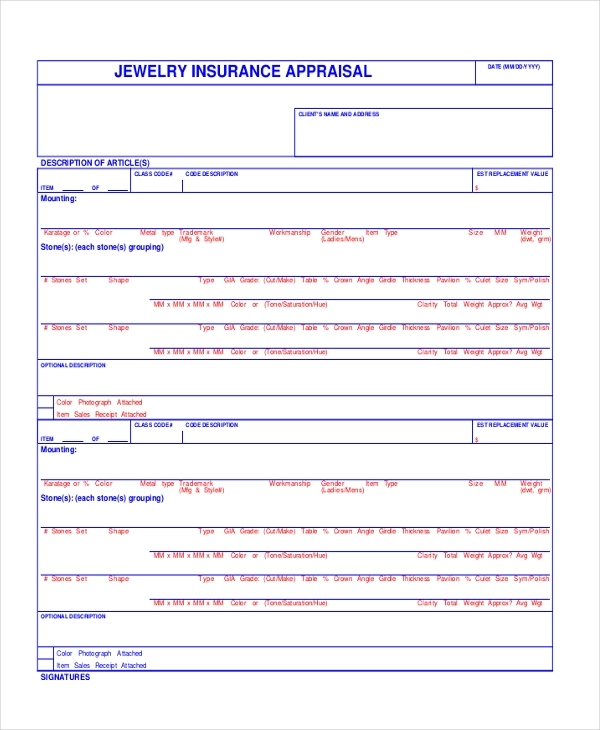 An insurance company uses a jewelry appraisal form to check the jewelry that needs to be insured. The form allows the person to jot down the details of the jewelry and submit it to the higher authorities in the company. 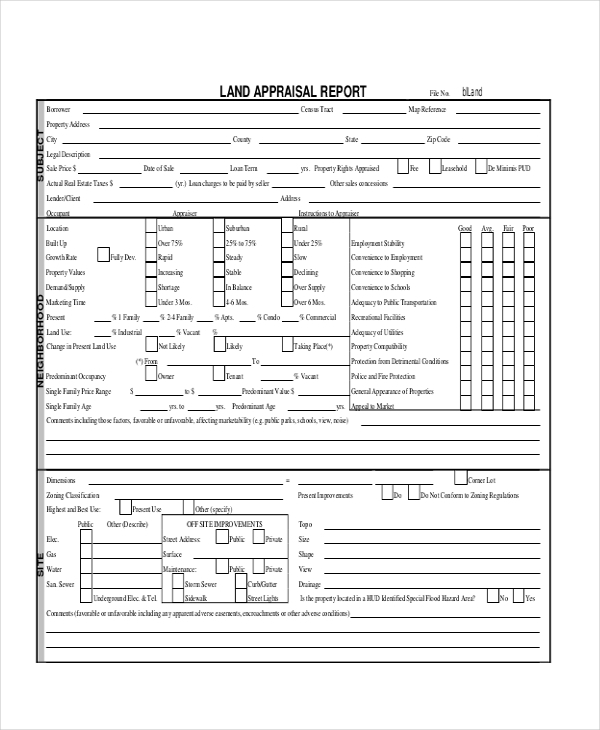 A real estate agent or a party interested in buying a land uses this form to assess the property. The form contains questions on various parameters which makes it easier for the assessor to make an efficient appraisal. Used to assess the leadership qualities of a team leader, this helps an organization to analyze if a person is promising enough to be promoted to higher grades in the company. 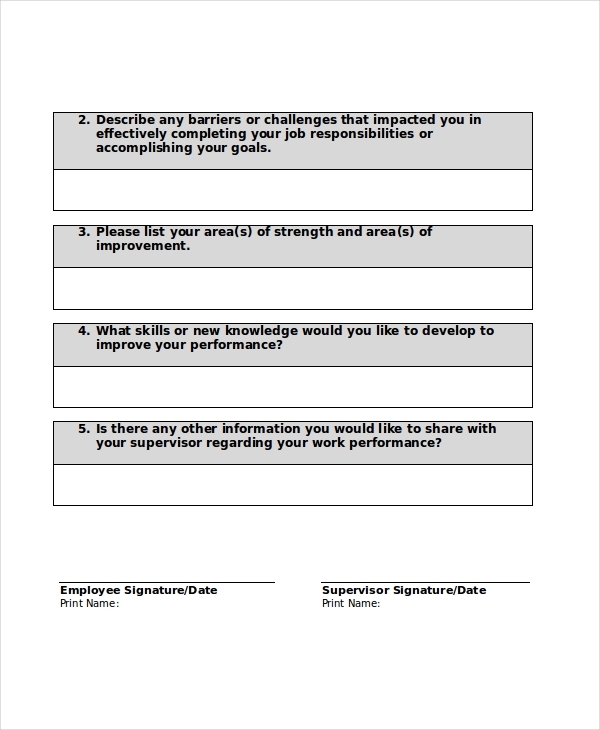 This performance evaluation template is used by the higher officials of an organization to gauge the performance of its managers over a period of time. The form enables them to appraise the person based on various crucial parameters. 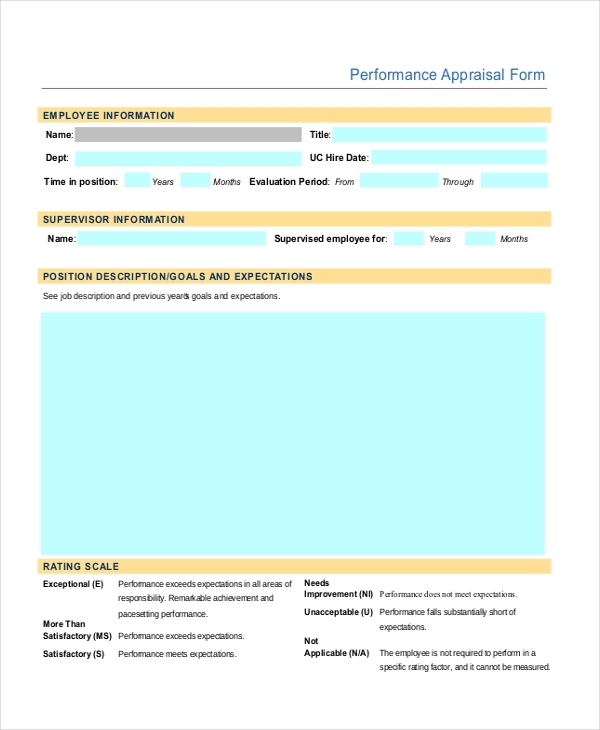 An organization that gauges the performance of its employees every month to assess their development and improvement uses a monthly appraisal form. This helps them to keep track of the employee performance. 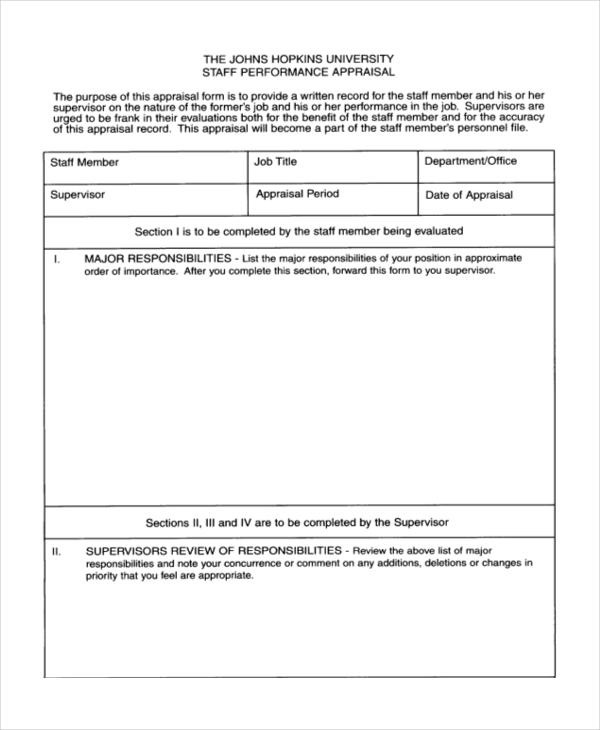 This performance appraisal example is used to assess the performance of an employee over a given period of time. It is based on this assessment that the company decides if an employee is up for a promotion or an increment. A real estate agent or a property expert uses a residential appraisal form to assess and analyze the condition of a residential property before recommending it to a client for purchase. Any person who may want to assess his personal traits and performance over a period of time can use a self-appraisal form. Using this form he can analyze himself against some crucial parameters that would give him an idea of where he stands. As the name indicates, this form is used by an employer to assess the performance and attitude of his staff during a given period. This appraisal helps him to reassess his goals and take necessary actions to improve things. 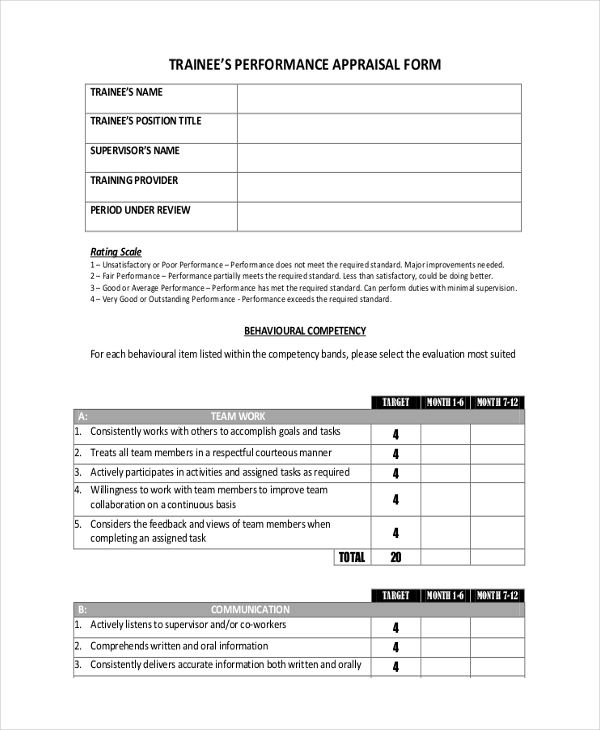 The principal or management of an educational institution uses this form to assess its teachers and gauge their performance. 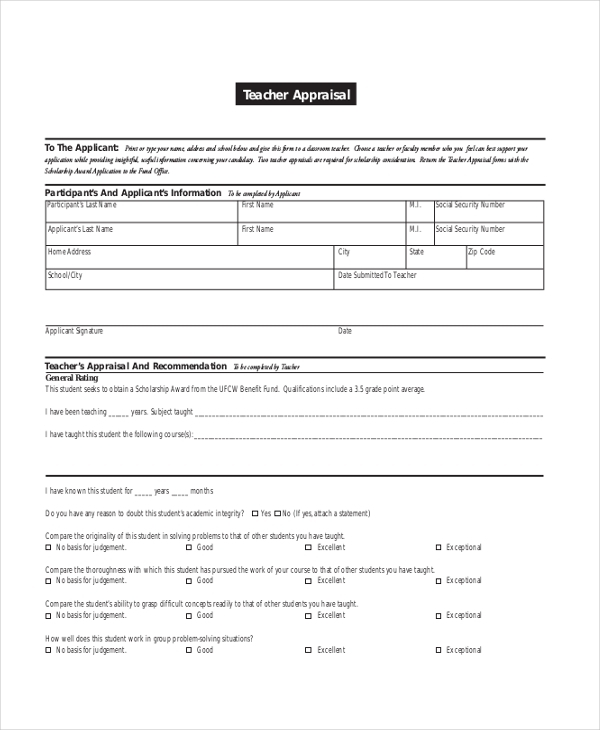 The form gives the assessor an idea of the parameters against which the teacher should be appraised. 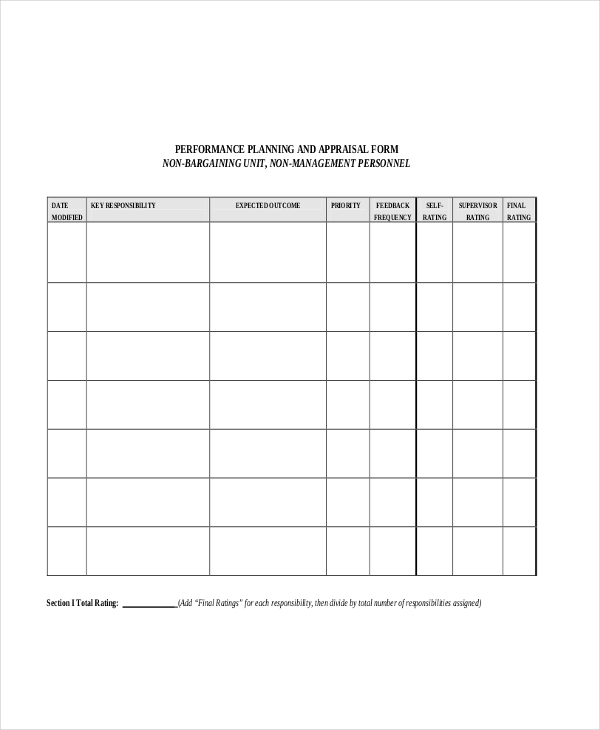 This form is used by a training organization to assess the performance of the participants during the training sessions. The form is filled in by the trainer with all the relevant details. A vehicle appraisal usually comes in handy when a person intends to buy a used vehicle. 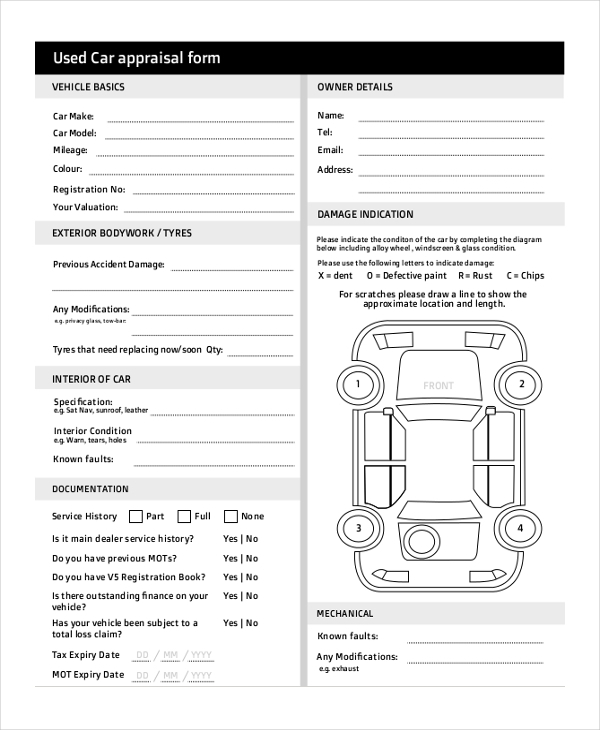 This form helps him to assess the vehicle in an efficient manner to ensure that it is in good condition. Whether it is to assess the performance of an employee in an organization or the performance of the whole organization during a year, a yearly appraisal form is the most suitable choice. Any person who intends to buy a business or invest into it uses a business appraisal form to assess the business. This gives him an idea whether investing in it would be profitable or not. 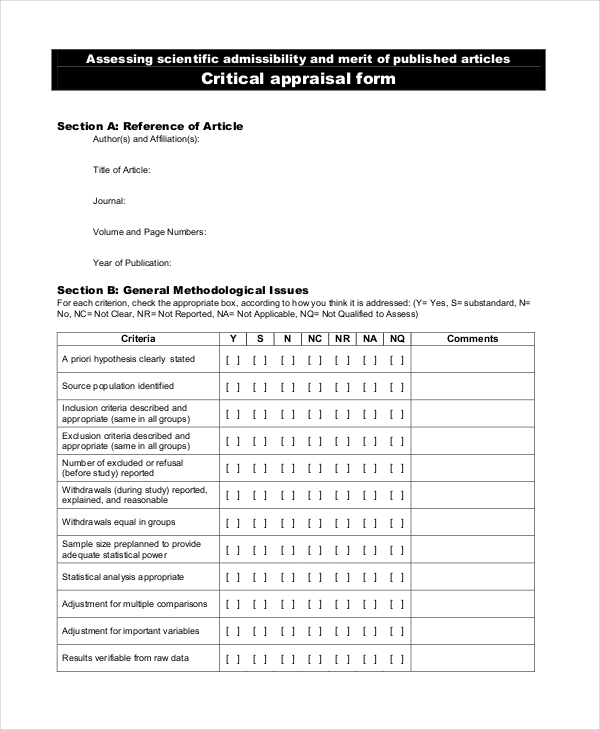 This form is used by a medical organization to assess the impact of the various journals and articles published by it over a given period. The form contains some crucial parameters which simplify the appraisal process. A 360-degree appraisal form is used to get a broader perspective of a person, organization or property being assessed. The form allows the assessor to make an in-depth analysis which in turn brings out more details. Any person or organization that needs to assess the performance of a person or the condition of a property can use appraisal forms. What to Put on Appraisal Forms? Since an appraisal form helps a person to analyze another person, property or organization, there should be some important parameters that should be included in the form. Like in the case of a performance appraisal form, there should be important subheads like the performance in the given period, significant contribution to various projects, goals met etc. In the case of a property appraisal form, crucial parameters like the physical proximity of the property from important places, the physical condition of the property, repairs required etc., can make for an efficient assessment. You may want to discuss this with an expert to understand what parameters would make the form an efficient one. 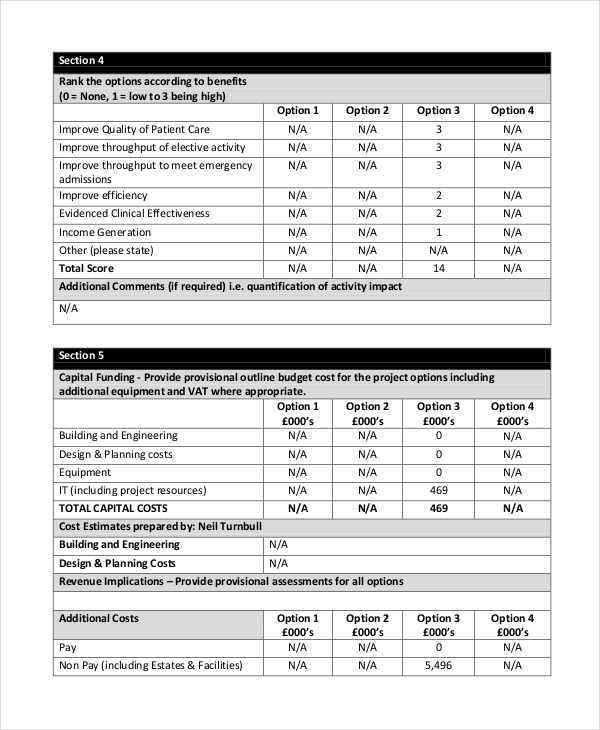 Thinking to design an appraisal form but not sure how to do it? Browse through our selection of appraisal forms to find the one that would suit your requirements. 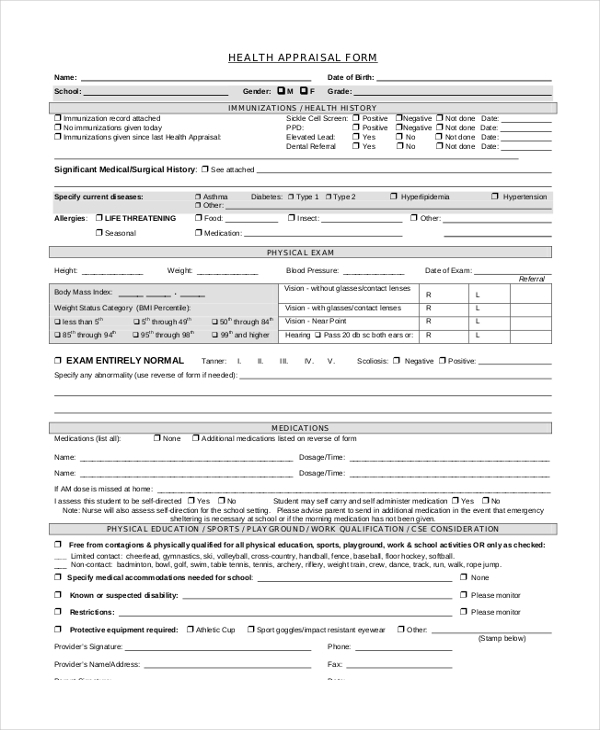 These forms can be easily downloaded and are customizable. Since these are print ready, these help you save a lot of time.